The bad news: Child obesity is on the rise, our diets include increasing amounts of processed food, and it seems that more and more kids aren’t getting the nutrients they need. According to the Mayo Clinic, kids with unhealthy eating habits are likely to continue those habits into adulthood, putting them at risk for a host of dangerous health problems. The good news: Children and even teenagers tend to listen to their parents about nutrition (really!) and tend to follow their lead. According to experts, family cooking sessions are great opportunities to talk about nutrition, encourage kids to try new things (even picky eaters are more likely to dig in when they've had a hand in the preparation of unfamiliar foods), and, of course, have fun. For parents interested in cooking with their children, ChopChop is an invaluable resource. The mission of the organization is to inspire kids to cook real food, and their products give kids the know-how to do just that. ChopChop produces a cookbook (containing “more than 100 super yummy crazy fun totally doable recipes”) and a quarterly magazine in Spanish or English. 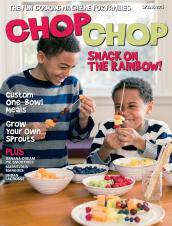 Each issue of ChopChop includes inexpensive, kid-friendly, healthy recipes, fun food facts, games and puzzles, and interviews with admirable public figures who are committed to healthy lifestyles. Recipes are accompanied by clear, step-by-step instructions – all of which begin with the mandate that kids wash their hands and clean the counter. Even non-subscribers can access ChopChop’s collection of recipes on their website where fare is divided into five categories: breakfast, lunch, dinner, dessert, and snacks. It’s difficult to imagine anybody not finding something to suit his or her tastes among delicious, hugely diverse options like chicken soup, panzanella, Parmesan yogurt dip with carrots, toshikoshi soba, sunshine smoothies, chai tea, German pancakes…hungry yet? The website, cookbook, and magazine are colorful, accessible, and appealing. Information is conveyed in simple language and accompanied by vivid pictures of food, and of kids in the midst of cooking up a storm. ChopChop doesn't post calorie counts or nutritional content, or demonize any individual foods, though their content is reviewed by a team of medical and nutritional advisors. One of ChopChop’s most valuable lessons can be learned simply by scrolling through the appealing pictures of the dishes they recommend: healthy eating can, and should, be fun, adventurous, and delicious.